Not a food item, a place. Cathy is writing on the food blog mmm-yoso!!! today. It's been so very hot and humid lately. Today it's nice - a high of 89F with humidity of only 45%. Still kind of miserable. The Mister started asking me to think of places that had good conditioning as well as lunch; something I usually don't think about...and when I started to think, all the places in my brain were outdoor only seating. Then I went back to my childhood in Detroit. We grew up without a/c and lived...but what did my brother and I do on hot summer days? I suddenly remembered- we'd ride our bikes to a local, air conditioned Bowling Alley...there was one on just about every block...Detroit had the highest number of alleys and bowlers per capita for a long while due to the proliferation of Auto Company leagues. The number of bowling alleys nationwide has been declining. But we are lucky to still have some in San Diego. Perhaps you've seen the signage when going to Zion Supermarket. Or maybe you noticed it when leaving the Zion parking lot (and the signage of not to park in front of their building). The murals are great. The air conditioning is wonderful (It must have been set assuming all 40 lanes would be in use). The Snack Bar was open. Order, pay and wait to hear your name called. The Hamburger Special (burger, fries, soft drink)($8). Fried egg and bacon sandwich ($5.75) and fried calamari ($5.50). The burger is the 1/3 lb frozen patty from Costco; I've purchased those for home and party use before; good quality. It's flat top grilled with a nice char, served on a fresh Costco sesame-seeded bun with a lettuce leaf, tomato, onion, pickle, catsup and mustard. Crinkle cut fries are always special to me. This was a good burger and fries without unnecessary frills. How can a fried egg and bacon sandwich be made special? Well with lots of bacon, of course. Yes. Less than $6, on bread of my choice, a slather of mayonnaise and two freshly fried eggs. This is just what I wanted. The Mister saw the fried calamari on the menu and wanted to try it. It was good. Simple breaded rings which were fried to a nice crisp and the squid meat inside stayed tender. Bowling Alley Calamari. I hope everyone is staying cool and eating well. Has anyone else gone to KMB to beat the heat? Yes! Dennis has on more than one occasion! mmm-yoso!! !, the food blog, is just that-a documentation of good, bad and ugly experiences, all eventually centering in on the central subject of food. Cathy is continuing this week of mediocrity with one of her recent experiences while Kirk and Ed(from Yuma) are out and about seeking something to write about. This is a short post. The closest Whole Foods Market is 11 miles one way from home. The Mister and I don't shop there regularly, but stop in when we are in the area and do enjoy almost everything purchased there, because we buy things we can't find elsewhere and it's an interesting place. We especially enjoy meals at the Whole Foods in store restaurants, usually before we go shopping. (I have a few more posts about those). One day a few weeks ago, the signage in the seafood section of the store caught my eye. "Made -To-Order Poke Bowl $7.99" salmon or tuna. I had to. I placed my order and the nice lady working proceeded to fill a bowl with rice from a rice cooker behind the counter. She then scooped out three scoops of the tuna (a good portion), squeezed out a marinade on top of the tuna and rice and sprinkled it all with black sesame seeds, sealed and labeled the bowl and handed it to me. It was quite heavy (and warm; fresh rice)...since the marinade/sauce had just been placed, we decided to wait until we got home to share this bowl as a snack. Well. The poke flavorings/marinade never really stuck to the fish and it dripped straight to the rice, so the rice was seasoned with the sweet/tangy/sesame oil flavors and good on its own. The fish didn't pick up much of any flavors at all. It was fresh and good (and pretty plentiful), but the next time we were shopping, I just bought a handful size amount of the sliced fish, brought it home and made my favorite recipe. Lesson learned. I hope your week has been better than mediocre. Ham and cheese baked into a bread...a compendium. You've found mmm-yoso!! !, the blog about food. Kirk, Ed (from Yuma) and Cathy are the usual bloggers here. Today, Kirk and Ed (from Yuma) are both away from their computers and unable to blog, so Cathy is writing. Today's post is about a common food item coincidence discovered while logging, deleting and organizing photos and events to eventually blog about. Yep, I've been staying indoors during these crazy humid days and it's this, football on TV and completing Continuing Education credits online. I was amazed at how many photos I have of the simple food item of ham and cheese baked into a bread and decided to share the variations I've found in Southern California. Some places I have blogged about before and some places will be posted in the future. Last October, I wrote about Euro Pane, a bakery restaurant in Pasadena. Ham in chunks and melted cheese, along with onion and carrot baked into a crispy crusted, quality bread ($5) (it's quite large). Simple and wonderful. Here's a cross section of the ham and cheese from Paris Baguette ($2.20) The croissant, crispy, flaky, fluffy, also has a sweet glaze on top. It's disconcerting at first, but since there is very little ham or cheese filling, it makes the majority of the bites (the bread) rather pleasant. In June, I traveled to 85C Bakery in Irvine. Twice. This Taiwanese bakery sells a ham filled cheese topped soft bread roll ($2.25) It's very cheesy, tasty and unique. 85C Cafe and Bakery 2700 Alton Parkway, Suite 123 Irvine, CA 92606 (949) 553-8585 US website Open 7 a.m. daily. Right across the parking lot from 85C is Bon Epi, a Korean bakery, which makes a wonderful ham and cheese croissant. It's one of my top two. Best Donuts and Deli is a Mexican Bakery located two storefronts from Little Sheep Hot Pot. A new Starbucks was built at the corner of the mall and The Mister and I walked in here looking for a treat to have with a coffee. These trays were next to the counter, ready to be set out. I asked what was in the small rolled breads; the nice lady handed me one - as a sample. Ham and cheese in a perfect ratio with the bread; the ham was chopped, it is a hard white Mexican cheese that isn't too melty-gooey and there were chopped marinated carrots in the mix. It was really a perfect bite. Two for $1. The bread is a nice, chewy white bread, not anything flaky nor soft. Simple and very good. As you can see, we also got two sweets. A longer post (about the torta sandwiches and donuts here) is forthcoming. K Sandwich also makes a ham and cheese croissant ($2), and the result is amazingly consistent. These are photos from three different visits. You can see the croissant dough has a crispy flaky crust layer with a softer bready interior and that pieces of white cheese are rolled inside the ham before baking. It's an easy, quick snack. K Sandwich corner of Convoy/Linda Vista at Mesa College Drive (7604 Linda Vista 92111) Open at 6 a.m. Mon-Sat, 8 a.m. Sunday. Santee has four Starbucks stores (if you count the one inside the Vons) and next to the one located in the Albertson's parking lot is Pink Donuts, which sells a ham and cheese filled bread ($1.75). A very soft, buttery bread surrounds a good amount of ham. The bottom part of the ham has a thin layer of a soft white cheese. Good, because it's fresh, the bread crushes easily. Not bad in a pinch/early morning when I don't want to drive very far). Pangea Bakery Cafe, on Convoy street, sells good sized ham and cheese bread semi-loaves for $2.50. A hunk can easily be shared by two people. A sofrt bread topped with cheese and layered with a good amount of ham and yellow cheese. When this is fresh (or toaster oven re-warmed), it's an excellent meal. I recently wrote a post about Cream Pan, a Japanese bakery in Tustin. The ham and cheese croissant here is exquisite ($2.50). It isn't very large and that's OK. This is the only place that bakes in Swiss cheese with the ham, and exposes (and slightly crisps) the ham. The flaky croissant makes the prefect ratio to the meat and cheese filling. I never get a photo of the cross section, because we exit the freeway and are in and out of here quickly; the croissant is consumed in the car as I drive away. Trust me, it's good. I haven't posted on Sidecar Donuts yet, but went here twice in less than two weeks in June. A small popular bakery in Costa Mesa, Sidecar has lines of people out the door and into the parking lot daily. It sells more or less 'regular' (but fancy) donuts and each day also sell one even-more-special item. This day, it was a Monte Cristo Donut ($3.75). Filled with ham, cheese and strawberry jam then fried and topped with powdered sugar, as an egg dipped and fried Monte Cristo sandwich would be. So it's not a bread dough, but still ham and cheese filled and delightful. I thought I'd add it in here, since it almost fits the topic. To conclude this post, and possibly answer your inner comments, of course this can be done at home. Above is a meat and cheese bread The Mister made the other day with a one pound refrigerated dough, Jarlsberg cheese and and hard salami. He baked it on a cookie sheet on the outdoor grill; placing the cookie sheet on the opposite side from the heated burner. Radient heat you know. I hope everyone had a good weekend and that the week ahead will have normal weather. Thanks for reading. Summer is almost over-even in San Diego. Meals change. mmm-yoso!!! is the food blog you are reading. Kirk and ed (from Yuma) are still busy this weekend, so Cathy is continuing to blog. Despite this crazy hot weather we've had the past few weeks, the clock tells me that days are getting shorter. Waking at 6 a.m. with darkness broken only by the light of the moon (if there is a moon) and the sun not peeking over the horizon for another half hour or so means the chill I am enjoying only for another hour now will be the norm in a few weeks. A look at the calendar reminds me that menus will be changing. I thought I'd post about some meals and/or snacks enjoyed over some of the warm Summer days. One June day when I was volunteering, I chose the Pesto Chicken box lunch, thinking it would merely be the least offensive choice. This was the most surprising, delicious flavor combination and sandwich I have had in a very long time. Not only was the chicken a full grilled breast half, served with lettuce, tomato and a mild cheese along with the pesto, but a grilled red pepper completed the flavor points. I learned to roast peppers over an open flame at home, pop the peppers into a plastic bag to steam and easily peel off that skin and have peppers available in the fridge to satisfy cravings and use on sandwiches made at home. Starbucks re-released their green coffee based beverages called Refreshers (originally San Diego was a test market in the Summer of 2010), the Cool Lime and Very Berry Hibiscus flavors are available in packets and cans or can be made for you in the store- fresh mint leaves compliment the lime and small berries are in the very berry flavor. Neither has a hint of coffee flavor or bitterness, and neither is overly sweet...they are refreshing Refreshers, but I think they will again go off the menu when other seasonal beverages are back in the rotation. Cold noodle plates, like this Hiyashi from Yakyudori Yakitori, will be leaving menus soon. So simple, refreshing and filled with flavor. I always wait to see the signage on the walls of Japanese restaurants announcing the return of cold noodles. Must get one last meal of these in before they disappear. These most creatively delightfully flavored, thick and crunchy Lays potato chips, made in Canada and given to me from caninecologne after her vacation there this past summer are but a mere memory and now on my list when I will be able to visit Canada later this year. This ingredient list shows you how creative the meld of flavors are to make the chips 'merely' ketchup flavor. Radish concentrate, dehydrated garlic, black current concentrate? Who would've thought? The small shave ice bowl at Big Joy Family Bakery is only purchased one time a year, even though it is available all the time. The shaved ice is topped with a very good vanilla ice cream, sweetened condensed milk, small mochi and sweet bean powder, surrounded by fresh fruit (pineapple, strawberry, kiwi and banana) for less than $5 makes this an affordable treat. I hope everyone made it through this hot (but not not humid) weekend and Summer. Another week begins and Autumn will be here on Friday! mmm-yoso!! !, the food blog is back today with Cathy blogging. Kirk and ed (from Yuma) are researching subjects so they can blog again soon. Hello again. With the crazy hot weather of late, The Mister and I have been cooking outdoors as much as we can, and keeping the inside of our home cool. I thought I would share some easy recipes and a few techniques. Grilling corn in the husk is easy. Put the whole ears on a medium heated grill. Turn the ears every five minutes, as the husk burns. 20 minutes total. Remove and let cool a minute and hold the 'tip' end. Pul from the top and the silk comes off with the husk. Clean, cooked corn! You can eat this as is, it's been steamed in the husk and if fresh, needs nothing added. Or you can make Mexican corn, using cleaned corn with the above photographed ingredients: Mayonnaise or olive oil, Cotija grated cheese (it's like Parmesan- a hard cheese)(you can buy it whole and break it into small pieces) and Tajin seasoning(a chili pepper, salt, dehydrated lime juice mix). If you put 'cleaned' corn onto the medium heated grill, brush with a bit of olive oil first then roast it until it is lightly charred (I do this with 'older' corn) it cooks in about ten minutes. You need the stickiness so you can coat liberally with the grated cheese and Tajin. This tastes like summer! Now, back to the grill. This is a new flavor point for me. Grilled lettuce. Cut a head of Romaine in half, brush with olive oil and sprinkle on salt and pepper (I have also done this with Italian seasoning and also salad dressing and both work, but I think each has almost too many spices for my palate). Place the cut side onto a low to medium heated grill, maybe for a minute. Turn over and place the other side on the grill(there will be some oil and salt/pepper on the grates because olive oil /salad dressing fell into the cracks; this side seems to be done very quickly). A simple salad. "Butterflying" is a cutting technique- you butterfly shrimp, whole fish and steaks- cutting part way down and laying the shrimp or piece of meat flat..if you do that same technique to fowl the technique is called 'spatchcock'. Basically, I cut down the back of the chicken and flatten it, pushing down and breaking the breastbone if necessary. This photo is a spatchcocked chicken that was placed onto an edged/jelly roll sheet pan and sprinkled with some seasoning and placed on the other/unheated side of our gas grill, using the grill like an oven. The chicken, and all fowl, cook faster using this cutting technique. This chicken was done in less than 30 minutes. This 15 pound spatchcocked turkey was done in 90 minutes (at 325) this past Thanksgiving. I hope everyone has a good weekend. You can grill stone fruit (nectarines, peaches, plums) and just about every vegetable, using direct or indirect heat. Stay cool and eat well! mmm-yoso!!! has a post about food almost every day. Kirk and ed(from Yuma) just can't post right now. Cathy is able to post now. "May gray leads to June gloom" is a fairly common San Diego weather report. We had a bit more than gray yesterday. It was Tuesday and The Mister and I planned to take advantage of "Residents Free Tuesdays" at the usually Admission Fee charging museums at Balboa Park. As we got off the 163, it was really raining. The gray clouds made the blooming flowers seem even brighter in color. The Koi at the Japanese Friendship Garden were especially friendly. The other Museums open yesterday were the Museum of Man, Museum of Art, Art Institute and Mingei International Museum. The Mingei has quite a few interesting shows going on right now. We had planned to have a light lunch at the Tea Pavilion at the Japanese Friendship Garden and making that a post. However, there are only two inside tables and the rain was not letting up. We walked through the museums then drove toward Little Italy and somehow ended up in Point Loma and stopped here. Oh. That "Pony" marker was to put on the table for identification when the order is brought out. Excellent soup. Three bean vegetarian. Thick, hearty, wonderful flavored. Just right on this chilly day. This was a great find for us. Perfect on this rainy day. I imagine it gets pretty crowded with all the seating available. There are pastries, breakfast items, cold and panini and wrapped sandwiches and apparently some pretty good coffee and cold beverages also. mmm-yoso!!! is a blog about food. This episode will be hosted by Cathy. Because Kirk and ed(from Yuma) are not available to host. Hi again. The Mister and I eat and cook at home, we don't always go out. I thought I would show you a few ways we work around the kitchen. underwater the whole time. The seeds fall to the bottom. The membrane floats. It's physics. Remove shell/skin and membranes, drain and you have perfect pomegranate seeds! You eat the arils raw this way or make juice and strain the seed pulp out. Straining the fine seeds is much more work, and why you pay dearly for pomegranate juice items. Bacon seems to be difficult for some people to cook. Really, it is simple and not messy. Line a cookie sheet-the kind with all sides raised- with a piece of foil and place pieces of raw bacon, not touching, on the foil. Bake in a 350° oven. If the bacon is thick, turn it after 20 minutes and bake about ten minutes more. If it is thin bacon, bake without turning for about 25 minutes. The Farmer's Market Bag from Specialty Produce a few weeks ago was interesting. That yellow thing in the second photo is a citron, commonly called a Buddha's Hand. Yes, the bottom right corner of the second photo are purple potatoes. Everything in this bag was something we liked and could use to supplement our meals at home. Except it had been really hot and the kale (at the top in the 2nd photo) which I would normally use in a soup, was not going to happen, since we had had three days of temperatures hitting 100° out here. Kale is said to be an antioxidant and highly nutritious also, like the pomegranate. I decided to make kale chips. I tore the kale into bite size pieces and placed in a bowl, topping it with olive oil,salt and pepper and tossing until all the kale was coated (that bunch in the photo made two batches- both for the bowl and for the cookie sheet). Place the pieces not touching on the cookie sheet. I baked at 350° for 15-20 minutes, checking that the kale is crispy before removing. Oh. The Buddha's Hand was sliced (you can eat the pith and there is no juicy center) in about 1/4 inch pieces and boiled, on low heat, in 2 cups of water with 2 cups of sugar for about 2 hours until the liquid was almost gone. The pieces placed in a pan of sugar, coating on both sides and placed in the refrigerator. A tart and sweet snack treat! I hope everyone is having a non-hectic month! mmm-yoso!!! is a food blog and today Cathy is blogging. Because Kirk and ed (from Yuma) are eating. Hi. The other day, The Mister and I went to Chopstix and got large bowls of soup, because at 96°, with 18% humidity, it just wasn't warm enough for us. The top one is the miso ramen and the bottom one is the dumpling ramen. Each about $6.50, huge, tasty, warm. When we were done, we walked out and wanted dessert. We thought about Yogurt World and Tapioca Heaven, but this new building is closer when you walk across the street. Crepe World. (The Nice Young Lady who waited on us was wearing a Yogurt World t-shirt; I did not ask if they were owned by the same people)It is right on Convoy, so you don't have to encounter what I like to call the 'parking lot from Hell'. It was not crowded. As in, we were the only people there, our order number was 13 and it was 6:41 in the evening...I think this was the second day of it opening. A large area, lots of tables and chairs and some park benches for seating...a rather extensive menu of savory (takoyaki, various 'sandwich crepes') and sweet crepes and waffles. There is a website on the business card, but it is not set up yet. We ordered and each crepe was served up in pink paper cones. (click to see full photo)(Typepad is acting strange again) I chose the #20, red beans with custard and bananas ($4.58). It was huge and filled with all the ingredients. The crepe was light and crispy on the edges. The custard was light and eggy tasting, the red beans were sweet and tasty. The Mister chose the #15- a fruit crepe stuffed with Nutella­® and fresh strawberries ($3.68). The same delightful crepe, filled with nutty, chocolate-y Nutella­® and sliced juicy, flavorful strawberries. A nice ending on another hot, but not humid, day in San Diego. Saturday Stuffs: Seafood Island coming soon, and our "Thanksgiving leftover" dish. Many thanks to the half dozen folks who emailed me about this, including FOY, Tanya and CandiceW. I passed by yesterday, and there is still a bunch of construction going on. Looks like a very nice restaurant, in a bit of a strange location. You can check out the website here. The menu is humongous, enough to give you "Vietnamese menu overload." The cuisine is described as "authentic" Vietnamese, Chinese, and Korean (??!??) cuisine. Regardless, it sure does look like a seafood lover's dream. I like to think we're pretty good at minimizing food waste. The Missus and I love leftovers, and try not to waste. Unfortunately, there's always the case of making a dish, and having stuff left over. And sometimes we do end up throwing things out. We're trying to be a bit better, and not waste. One of the dishes that is heaven sent when it comes to having leftovers from making various Japanese dishes is Oden. I had thought we'd be eating pretty simple this Thanksgiving....... until the Missus decided She wanted, "something good for a change". One of the "somethings" was Gomoku Gohan a mixed rice dish. And in addition to the leftover dashi, I had a bunch of other stuff left-over from the variety of ingredients the Missus wanted in Her rice. Having a variety of fishcake in the freezer, purchased during sales are heaven sent. There are several standard Oden items the Missus doen't like in Her Oden; Kamaboko and Chikuwa, two types of fishcake...which ironically, are two of my favorite things! The item the Missus requires in Her Oden are hard boiled eggs and Konnyaku. If you're not up to making your own shiro, there are many types of Tsuyu (instant soup base) available, and you just have to add water. If you use them, make sure you're not sensitive to MSG. Hi. It is October and it gets darker earlier and is kind of chilly in the evenings(despite being in the 90's during the day) and sometimes The Mister and I come home late from work and want something quick yet tasty to eat. I sort of "invented" this recipe a few years ago when the power was out in the neighborhood. We still have our propane fueled grill outside and were trying to use up things from the fridge and freezer. It is simple and does not require you to go scavenging through the house for spices in the dark, yet is tasty and filling. 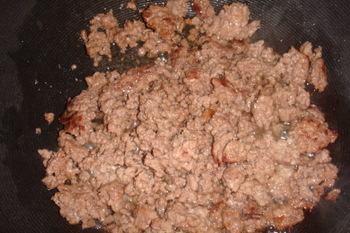 Brown 1/2 lb of ground beef in a pan. You can brown things on a gas grill in any regular pan, just like on the stove. 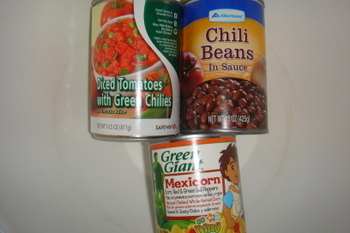 Always have these ingredients in your cupboard (buy when on sale)- Diced tomatoes with green chilies; Chili beans in sauce and canned corn. I got this MexiCorn when it was on sale. It is just corn with red and green peppers. Drain the corn and put into the pan with the ground beef. 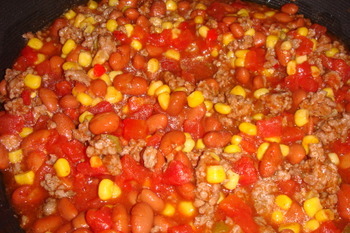 Use the whole can of tomatoes and the whole can of chili beans. Really, you don't need to add any spices. 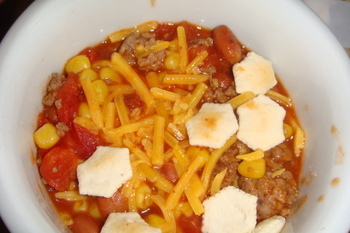 If you want to, serve with some shredded cheese on top, and some crackers. I only have oyster crackers. It makes things festive. Especially if you have no electricity. Whoo hoo! 1 small (7 oz) can corn (or corn with green and red peppers), drained.